Parish of Auchtermuchty – The Fife Post………..for genealogy and historical information. AUCHTERMUCHTY, a royal burgh, and a parish, in the district of Cupar, county of Fife, 9 miles (W. by S.) from Cupar; containing the village of Dunshelt. This place, of which the name, in the Gaelic language, signifies “the cottage of the king,” is supposed, from that circumstance, to have been appropriated to the accommodation of part of the royal household, during the king’s residence in the palace of Falkland. The church, a plain building erected in 1785, was enlarged in 1837 and now contains 1100 sittings. There are places of worship for members of the Free Church, the United Secession, and the Relief Synod. This parish is four miles long and 1 to 2 miles wide. The burgh and town of Auchtermuchty is situated about a mile from the southern boundary of the parish by the river Eden. The road from Stirling to St. Andrews passes through the southern end of the town, and the road between Perth and Edinburgh also passes through the town, and a coach has now been established on the road for several years. The boundary with the county of Perth is less than a mile from the town of Auchtermuchty on the north. 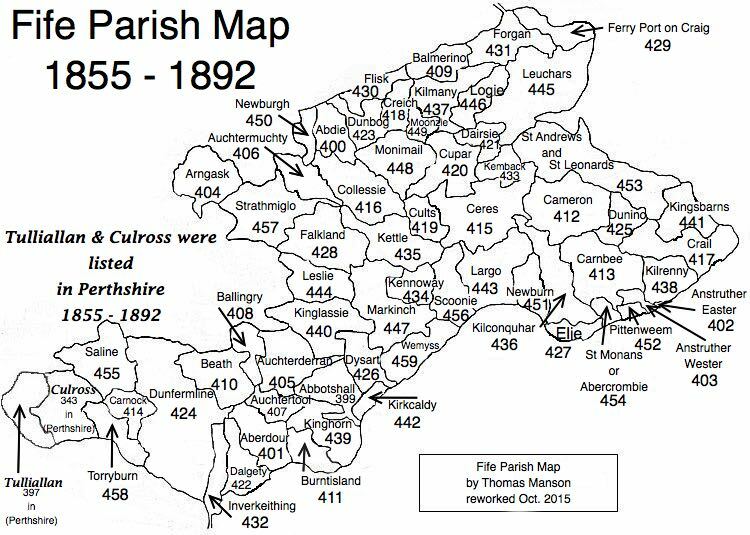 The population of the parish in 1811 was 2403 and in 1841 was 3352. In addition to the burgh and town, which has a populaton of 2550, there is a village of Dunshelt with a population of 601, and in the landward part of the parish the population is 293. The number of families in the parish is nearly 750 of which Dissenters form about one-half. The parish church was built in 1780 and added to in 1838 so that it now accommodates 900 sitters. In addition, there are three dissenter meeting houses in the parish: two in connection with the United Secession Church and one belonging to the Relief. Together they seat 1200 and are well attended. There are six schools in the parish of which five are in Auchtermuchty and one at Dunshelt. One is the parochial school and three are village schools. The number of imperial acres cultivated in the parish is nearly 2600. The above extract comes from the account written in January 1843.